Sabbath Walk: On "Chronological Snobbery"
Things new are not necessarily superior. Things of old are not necessarily better. I remember years ago the excitement at a school. What was life like 50 years ago? What kinds of fashion or things most defined that generation? The unveiling of the time capsule gave present day people a chance to glimpse at the past. After some searching for the actual location, the time capsule was found. When opened, there were old school uniforms, school magazines, books, newspapers namecards, and old photographs. The purpose of the time capsule was to communicate to future generations the life and culture of the times back then. It is usually a very exciting event as people go "woohs" and "wahs" about how life had progressed over the years. I suppose a typical time capsule to describe our modern fast-paced Western society would comprise of some electronics, DVDs, picture of an electric car, green initiatives, newspapers, electronic tablets, some website pictures, an iPhone and a Samsung, and anything to represent what 2014 looks like. Perhaps we can include web addresses, the way we communicate, social media, and other creative things we can think of. Generally, when we look from a technological angle, things now are way more advanced than things then. This is evident from movies about some futuristic characters zapping through time to land sometime in a historical past. Like the Star Trek IV: The Voyage Home, where the Starship Enterprise had to travel back in time to look for primitive whales in order to save themselves from potential destruction. As the crew traveled 300 years back into the year 1986, they mesmerized earthlings with their advanced communication devices, their technological prowess, and more classy ways of getting things done, like the classic Star Trek "Beam Me Up" effect. As a Star Trek fan, I saw everything from the standpoint of the Star Trek heroes, and becoming amused at the way 1986 people were so "primitive." I lived out a little bit of what CS Lewis had called: "Chronological Snobbery." What Lewis was trying to warn us was the uncritical acceptance of things newer over the old. He wanted us to question the assumptions we bring to anything. He reminded us about the folly of discarding the old in favour of anything new. This is a message that becomes more relevant in the light of a generation that worships the latest and the greatest. For if we hold this assumption uncritically, we may even begin to dismiss tradition, the Bible and the Christian faith as "old-fashioned" or "irrelevant." A) Latest and the Greatest? From worship songs to books, from old devices to the coolest gadgets, we are swamped with marketing and advertisements that entice us to buy bigger, buy newer, and buy greater. People get excited everytime something goes viral. They ask what is the latest fashion in town. They get bored by the old but stimulated by the new. This is manifested very much in the cellphone industry. When the cellphone revolution took the world by storm more than a decade ago, people change their phones every year. I remember my friends changing phones so regularly that just catching up with them means catching up with what is the latest and greatest cellphone technology. There was the Motorola generation where brick heavy phones were a status symbol. Soon, with texting becoming more popular, Nokia began to dominate with their text intuitive designs. Then came the Blackberrys and the popular mini-keyboards built into phones. This was quickly overtaken by the iconic Apple iPhone. Now Samsung has entered the fray to provide Apple stiff competition. Technology has not only made phones smaller and more powerful, it has also helped bring the cost of ownership down. In technology, the unwritten rule is that the latest-and-the-greatest is usually better and more powerful. For those old-phone diehards, it is difficult to stay away from the new advances simply because they get outmoded and outdated. Not only that, manufacturers will eventually terminate any support for discontinued models. Sooner or later, one would be forced to upgrade. As far as cellphone technology is concerned, newer phones are often "smarter" than old ones. They have faster processors. They have bigger storage capacity. They have the ability to run more and the latest applications efficiently. Just look at the Apple iOS which is now in version 7. Those who insist on maintaining version 4.x and below will realize that the old apps they had previously purchased will eventually crash if they do not upgrade. "Chronological Snobbery" is hard to avoid as far as cellphones are concerned. Even if two phones are set down side by side, the one with the latest software and apps will often be more useful than the other. That said, technology does fail from time to time. Ask those who migrated from Windows XP to Windows Vista. Ask those Apple users who quickly adopted Apple Maps in 2012. Ask Yahoo! when they upgrade their mail services in 2013. Then there were the antivirus makers that packed more stuff into their suites and made the software clunkier and our computers slower. The list goes on that not everything new is better. B) The Things of Old are Better? On the other hand, the same can be said for those who glorify the past. One area of interest is the leadership styles of people who prefer to stick to old tested ways. When they fail to reach out to the newer generation, they often go back in time to dig out the past in order to win back some credibility. This works only up to a point. For when leaders continue to harp back at the past, I will start to suspect that they do not understand the current culture. They may very well have no clue how to plan for the future. Many business organizations fall prey to this. One of them is Blackberry. In the heydays, the Canadian technological icon was leading the world with their ubiquitous mini-keyboard handsets. Armed with security patents, Blackberry was the phone of choice for many financial institutions, government agencies, and even President Obama personally asked for a Blackberry in his first term in office. Unfortunately, they were upended by the touchscreen phenomenon, led by Apple. Within a few years, Apple iPhones and Samsung Galaxies overwhelmed Blackberry so much that the once fabled company is now in dire straits. Even the much touted Blackberry Z10 that tries to marry the touchscreen technology with their famous old keyboard feature failed to win back lost market share. There are many other factors as to why Blackberry failed to win back their old customers. One of the major ones is that they failed to anticipate the next wave: widespread adoption of Apple iPhones. Things new are not necessarily superior. Things old are not necessarily better. It is about the heart. That has never changed as far as worship is concerned. In any debate about the old or the new, we must not be distracted with the question of which is better or superior. We must adopt a posture of listening. We need a good dosage of humility in detecting what exactly are people talking about. For all we know, there are things which the newer generation will always maintain even when the packaging has changed. There are also things which the older generation will embrace even when the old melodies are gone. I remember a fellow board member in her 80s when I was serving together in Church. We were in the early years of starting a new Church community. In wanting to start out with an open mindset, we seek to create an atmosphere that embraces both the new and the old. Contemporary songs were interspersed freely with older hymns. People from all ages came together at the same time. There was only one service to begin with. This revered matriarch remarkably said: "What's the problem with singing contemporary songs?" She reminded the old folks that it is not about the song. It is about the heart. Right on! Being completely humble covers many grounds. If we are young, we demonstrate humility when we respect the old. We do not dismiss old ways outright but consider the merits of them, and adapt them if necessary. 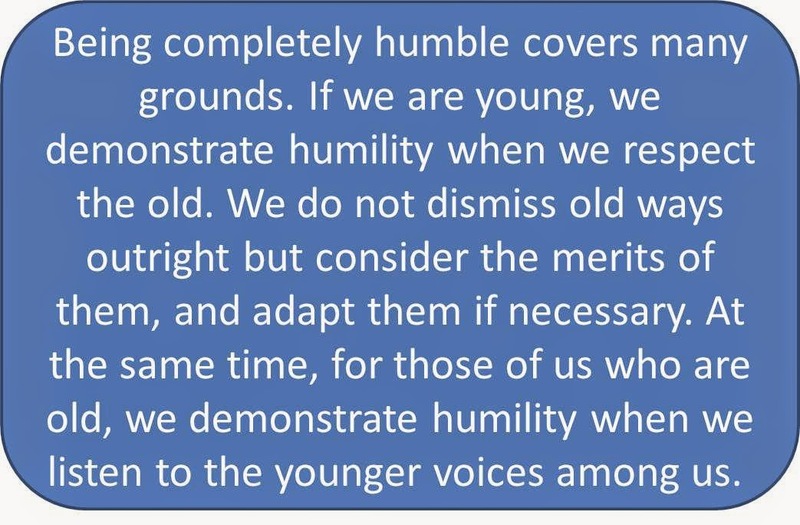 At the same time, for those of us who are old, we demonstrate humility when we listen to the younger voices among us. They are definitely more familiar with the latest and the greatest. If they can do something faster and better, why not? Perhaps, by listening more graciously to them, we are teaching them the beauty of maturity. That being old also means being more humble. The young and the old would benefit greatly by learning from one another. 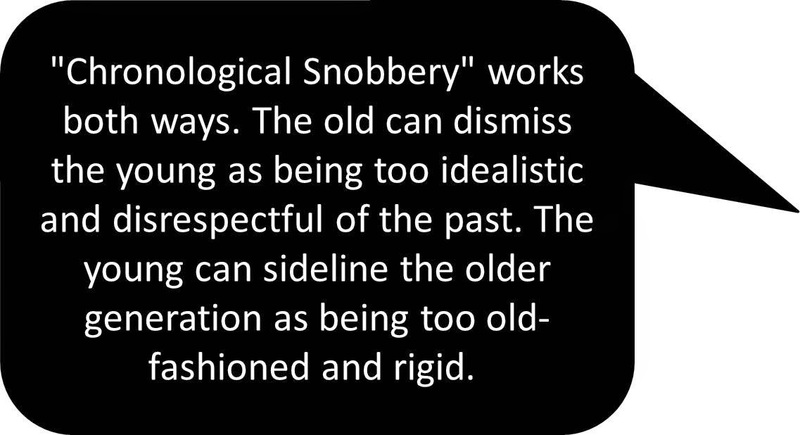 "Chronological Snobbery" works both ways. The old can dismiss the young as being too idealistic and disrespectful of the past. The young can sideline the older generation as being too old-fashioned and rigid. I think there are merits as well as demerits for the different generations. Why war on the generational differences? If God had given us one another to live together, surely, we need to learn to bear with one another, and at the same time, learn from each other. Humility is the super glue that unites not just the old and the new, but all generations. It is a virtue that will survive the test of time. It glues people together. One more thing. When we use glue to stick two pieces of material together, time is needed to let the glue set. For optimal results, it would best to give it a few days for the glue to do its magic. During this time, let the entire glued structure be treated as gently as possible. No sudden shakes. No vigorous movements. When the time is ripe, the whole block will not simply become one piece of art. It may very well be a masterpiece.